When a marriage ends and the legal wrangling starts, there are many possible ways to get organized. We probably all start off with good intentions to be organized, but the sheer emotional discomfort and overwhelming magnitude of the process can make it difficult to manage life ̶ let alone legal and financial logistics and paperwork! Being organized for your divorce does set you up for a better journey. If you organize what you need early in the process and have the information you need readily available, things will go faster and more efficiently. Lawyers and other professionals charge by the hour so the longer it takes them to obtain information or documents from you, the more it will cost you. Unfortunately, during a divorce, being disorganized or avoiding action can have a hefty price tag! A System: Having a system in place from the start can help, especially if it works well for your organizing style. Once in place, just keep adding to it as needed. A Habit: Making a habit of recording things well and staying on top of the items by doing a little bit daily is very helpful. A few minutes every 24 hours will add up to a smoother process. Honestly, I did not do all of this from the start of my separation but wish I had! Keep a calendar, dated notebook and/or journal (paper or electronic) just for your separation and divorce information, and write any developments in it daily. The parenting schedule should be here, including all changes made at the last minute or in advance. Note a quick summary of contents of emails, phone calls and texts that you may want to refer back to, so you can find them quickly when needed. Note any appointments and commitments with professionals so you have a good record of all phone calls and communications with your divorce team. If you are consistent with this, it becomes a fantastic record. At the time you think you will never forget these details, but when you’re emotional and feeling overwhelmed, you forget important things very easily. Make record keeping a daily habit. The best way to create a new habit is to tie it to an existing habit, like a morning coffee. Make it easy to do by keeping the tools handy in a set place like, in this example, where your coffee is stored. Do your notes while your coffee is being made. Do not skip a day. If nothing happens on a given day, record something, like a happy face 🙂 or a null sign ‘0’ to confirm that you thought about things and had nothing to record. Decide on one place to keep your records. Even if it’s just a box to put things that may be important, having everything in one place makes it easier to find things when needed. If you do this, the oldest items will be at the bottom. It is often easiest to sort through things oldest to newest, so flip the pile over to start sorting from oldest to newest documents. If you can manage more than a box, I suggest you set up an accordion file for different records. Label a new slot each time something new comes in that is related to your separation and divorce. Having one slot to put items with similar items really helps. Set up categories that make sense to you. You are the one who needs to find things, so what makes sense to you will work. You can use colour coding for different items, different issues, and different people. Set up what makes sense for you. Keep receipts that may be important. I kept receipts for shared expenses and had two files: one for those pending reimbursement and one for paid, with all the details noted on the receipts and the calendar. This can be kept inside the accordion file. I also kept utility receipts, legal bills and information for my budget. If you use a program for your financials, create some new categories for your new situation. You may find you need to refer to old emails, texts, notes about conversations and letters you receive. If in doubt keep it. It is better to have it if you need it then to need it and not have it. Do not keep older drafts because they can cause confusion. If you do keep them for the history of the agreement, mark them clearly with ‘DRAFT #_’ so no one, especially you, gets confused. Any electronic records of value should be routinely backed up and stored in a safe place. If your computer and back up system are in the same place you will most likely lose both in a theft, flood or fire. Consider a remote backup system! Do backups often! If I was doing it all again I would probably get the OurFamilyWizard app to record things electronically. It is set up for this exact purpose during a divorce. You can have all your emails documented in it if you both agree to use the same program. OurFamilyWizard is a great way this is to keep things cleaner and less adversarial because you both are aware that others can look at what you both are entering. 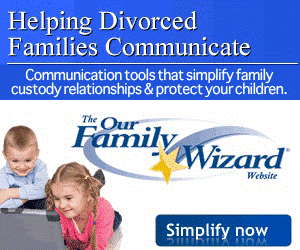 For more details, read my review of OurFamilyWizard. Once I had the separation agreement in place and thought things were done, I threw all my records in a big box, clearly labeled with an appropriate description (use your imagination here). When I came across anything related to my divorce like the final divorce decree, I just opened the box and threw it in. Thank goodness, I did keep my records! Years later my ex-husband wanted to reopen the financials going back many years. Since I had good records, that possibility didn’t completely terrify me. Divorces often get reopened when situations change. Hold onto your records until the statute of limitations runs out! I still have my box. Someday I may let it go, but only after all our agreement has run its course and been over and done with for at least 7 years. Create accurate summaries of your finances. Making a good concise summary and attaching all the backup proof, or at least have it easily available if anyone wants to argue, is smart and can save yourself a lot of money. If you lay out things in an easy to understand format, you can save a lot of time explaining the numbers to your ex and both of your lawyers. For example, I did a simple table of both our incomes, taxes paid, support payments and special expenses over several years to show what was happening and in one quick look, everyone was on the same page. No need to rummage through all the tax returns or receipts – this saved us lots of money and some sanity. Keep all your records private. Your children don’t need to know what’s going on between their parents. Friends, family and your ex dropping by don’t need to see any of your private records either. Keep things safe where only you can access them! 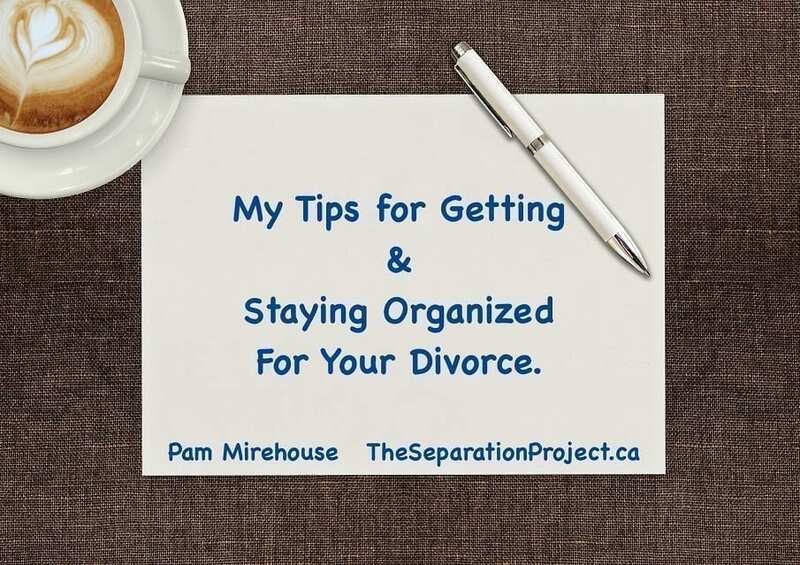 Remember that although being and staying organized is not a pleasant task for most of us during a divorce – it is very worthwhile because it can bring you some peace of mind amid the chaos. I would love to hear, in the comments below, what is working for you and what ideas and apps you have found useful to stay organized! If you would like help getting more organized or want more information about how I can help you divorce well contact me. As a divorce coach, with a professional organizing background, I can help put your mind at ease. You are so correct about being organized about every thing when going through a divorce and this software tool seems to be really helpful to assist the people in organizing every thing digitally and since this is a software tool, retrieving the past and relevant records will be easier at the click of the button.